The affect of class standing on access to post secondary education. Access to post-secondary education is disproportionately denied to youth from low-income backgrounds. The affordability of Canada’s universities ranks 19 of 23 surveyed OECD countries. 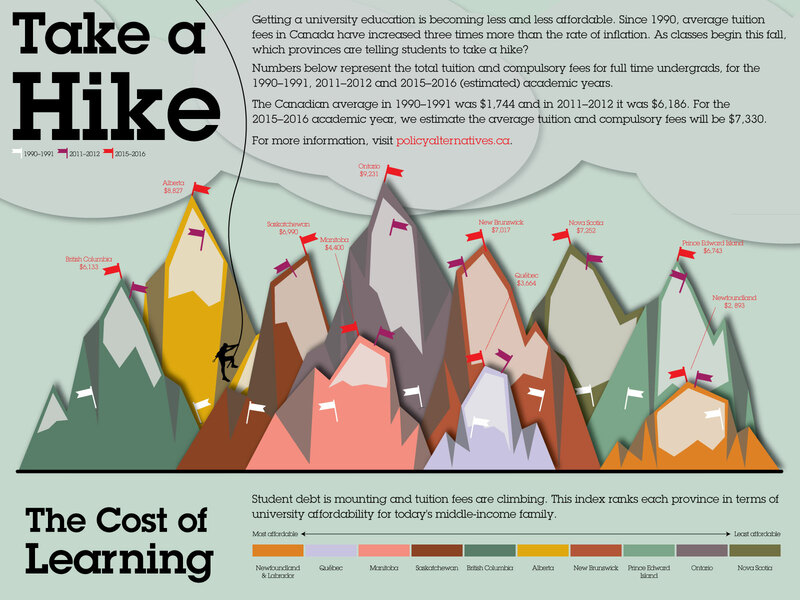 (2012b) Tuition fees have grown at approximately five times the rate of inflation since 1998 and, if unchanged, are estimated to exceed all other student expenses combined within five years (CFS, 2012). In 2006 families earning over $100,000 were more than twice as likely to have their children attend university than families living in or near poverty (CCL, 2009). Those with a university certificate or degree earn, on average, almost twice as much as high-school graduates (HRDC, 2012) and those who’ve graduated from post-secondary programs are far more likely to be employed than those who have not (OECD, 2012a). Note: Earnings and employment income are used as synonyms here. Average earnings are shown here. Source: HRSDC calculations using Statistics Canada, Census, Catalogue no 97F0017XCB2001002. Independent of tuition fees, class can limit a student’s chances to even qualifying for post-secondary education as family income influences childhood development. Performance in school directly affects university acceptance rates and a family’s ability to spend on educational materials or a private education influences the quality of a child’s education making children of more affluent families better suited to realize their academic potential and achieve university entrance level grades. (Frenette, 2007). Tuition may be the most obvious financial barrier to post-secondary education for low-income families, but it is hardly the only one. Student loans can help improve access to education, but continue to divide even graduates of the same program along class lines. Those who take out student loans during school are less likely to own significant assets and in far worse financial shape than those who don’t. Though, both groups share relatively similar debt levels, those who took out student loans have much less to show for their debt. The debt taken on by non-borrowers is more likely to go to major assets, such as cars, home ownership or the establishment of small businesses. The average value of assets of post-secondary graduates who took out loans is $60,700 compared to $106,300 for non-borrowers and borrowers’ average net worth is $17,500 compared to $61,900 for non-borrowers (Luong 2010). Making tuition more affordable would improve equality in access to post-secondary education and the opportunities that holds,however, to truly level the playing field will require changes throughout the education system, from elementary on up. In order to realize our greatest collective potential we must encourage every student to achieve their individual best. Knowledge is something to be shared, not sold to the highest bidder. 2012-2013 CAUT almanac of post-secondary education in Canada. From the Canadian Association of University Teachers, this almanac features a great deal of information on the state of post-secondary education in Canada with tons of easy to follow charts. Check out the Chapter titled “Students” for more information on access to education. All sources referenced or used in the creation of this report or recommended for further reading are available for free, in their entirety online to anyone with Internet access. Bowlby, Jeffrey W, and McMullen, Kathryn. Human resources and skills development Canada, Statistics Canada.“At a crossroads: first results for the 18-20-year-old cohort of the youth in transition survey.” (Hull: January 2002). Canadian association of university teachers “Students,” from, “2012-2013 CAUT almanac of post-secondary education in Canada.” (Ottawa: September 2012). Canadian council on learning. “Post-secondary education in Canada: meeting our needs?” (Ottawa: February 2009). Canadian federation of students. “Public education for the public good: a national vision for Canada’s post-secondary education system.” (Ottawa: October 2012). Finnie, Ross, and Mueller, Richard E. Measuring the effectiveness of student aid project, Educational policy institute. “The effects of family income, parental education and other background factors on access to post‐secondary, education in Canada: evidence from the youth in transition survey.” (Toronto: 2008). Frenette, Marc. Statistics Canada. “Why are youth from lower-income families less likely to attend university? Evidence from academic abilities, parental influences, and financial constraints.” (Ottawa: February 2007). Human resources and skills development Canada. “Special Reports – What Difference Does Learning Make to Financial Security?” (June 2012). MacDonald, David, and Shaker, Erika. Canadian centre for policy alternatives. “Eduflation and the high cost of learning.” (September 2012). Organization for economic co-operation and development. “Investing in equity education pays off,” from, “Equity and quality in education: supporting disadvantaged students and schools.” OECD Publishing (February 2012a). Organization for economic co-operation and development. “Education at a glance 2012: country notes – Canada.” OECD Publishing (September 2012b).